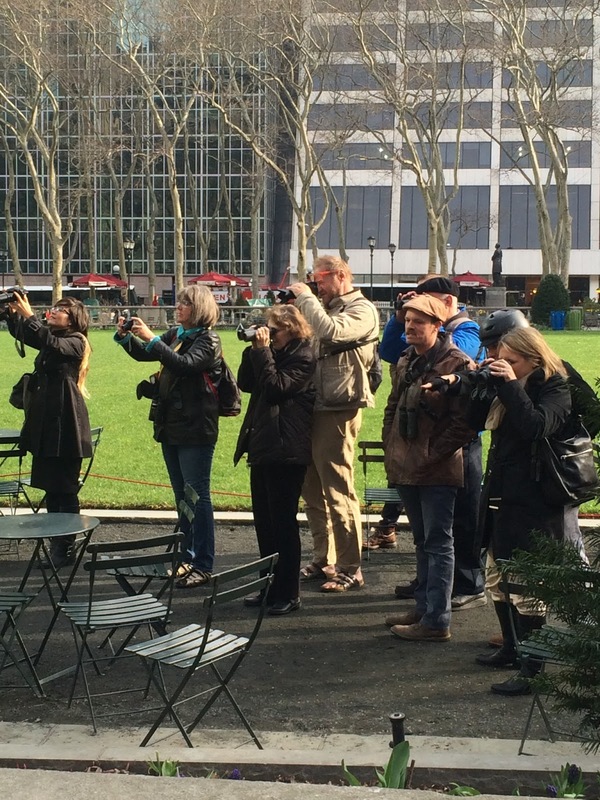 I am excited to resume my Bryant Park bird walks next week. For the first time, we'll be offering twice-weekly walks in the fall. We've been doing the walks twice-weekly in the spring for a while, but due to popular demand, we're expanding the autumn offerings as well. We will have one-hour walks on Monday mornings from 8-9am, and Thursday afternoons from 5-6pm. So if you are more of a morning person, and want to start your week off right, now you can join us on your way to work, and maybe we will spot bird species #120 for the park! Or, want to stop by on Thursday afternoon and see what activity is in the treetops? Now you have both options. Best of all, come on all twelve walks! You never know what we'll see. 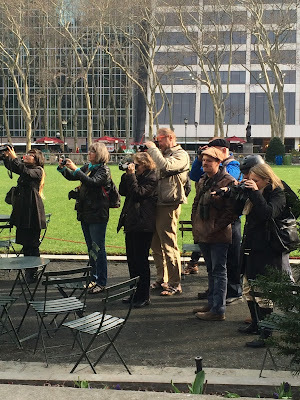 While many of the birds are common, expected species, such as the ubiquitous Rock Pigeons and House Sparrows, we have come to expect the unexpected in Bryant Park, with the spring series bringing sightings such as a Chuck-Wills-Widow (a cousin of the Whip-Poor-Will, rarely found this far north) and a Green Heron. The walks will span the majority of the protracted fall migration season: although some warblers and other migrants are already dispersing south through our area, continuing warm weather and southerly winds will postpone the bulk of the migration for a bit. The birds that are travelling south wait for favorable tailwinds (in this case, from the north) to help them on their journey. So although some of you may be lamenting the end of summer, cold fronts equal excitement for birders! Birds tend to migrate through the area in predictable patterns, with neotropical migrants such as warblers, vireos, orioles, and tanagers migrating earlier, and species such as sparrows and raptors, which are perhaps only going as far as the southern US, or may even over-winter in our area, appearing later. The species tend to blend in with the respective part of the season: warblers, vireos, and fall-plumage tanagers camouflaged in shades of green and yellow among the autumnal foliage, and sparrows arriving in October in shades of brown that blend in with the brown fall grasses and leafless trees. Birders walk the perimeter of the park, keeping a wary eye out for species #120! It can be a challenging time of year for bird identification. Many brightly-colored species have more muted off-season colors now that they don't need to impress a potential mate, and younger birds, which make up many of the individuals this time of year, are often the most nondescript in appearance. Roger Tory Peterson famously dubbed one group "Confusing Fall Warblers" in his seminal Field Guide to the Birds, but don't let that intimidate you. 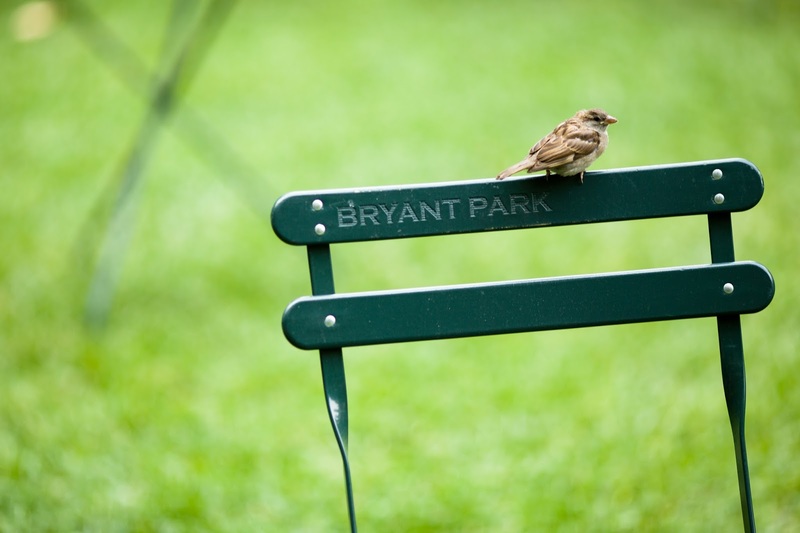 Although they may be more confusing than their brighter spring season counterparts, it's still a delightful challenge to spot them in the trees and shrubs of Bryant Park. And although identification will be more challenging, it is not impossible, and I will help you learn how to distinguish the various species we may spot. I'm excited to double the number of walks this fall, and to hopefully see species #120 for the park with you!